We match and test most tubes with the AT1000 tube tester. Not, because this is the best tube tester, but we use it because it can be bought new, many people are using it, and it serves the purpose we use it for. The finest tube tester ever made, to my opinion is the Sofia. I tried to order two in 1995 when I started my company. Orders were initially taken, but cancelled after some months as they were closing production. There are actually a few modern tube testers which will do a similar nice job like the Sofia, but they all have many limitations. Or, we can use the Russian L3-3, but that one gives no printed results. Given the many software issues, and when you learn how to avoid those, the AT1000 can be used. The tester is not attractive, but she is the only girl in town. From a practical point of view, we can do the things we want with the AT1000. We spend the nice sum of 7000 Euro on a dedicated test place, with it's own PC, own printer, automatic data back up, and two AT1000. A third one we have in the test room at the Emission Labs factory. Also I found out how to install the program twice, so be able to run two AT1000 on one PC, under Windows 10. It should be clear, a like new testing used tube is better than a like used testing new tube. For instance factory-new Russian often come out of the box with values like fairly used tubes. On the other hand, I see often used Telefunken tubes, which test like new. So what is better? I think I know the answer. If a tube tests good, then the next question is about expected lifetime. However there is no way to measure this in hours. Yet we can only derive it more or less meaningful from other parameters. Mainly from the combination, and not from isolated parameters, and sure not from tube curves. Under normal circumstances, remaining lifetime should be derived from the transconductance, if measured correct. This has been done so ever since by Hickok, and the company was indisputable the leader for this. However, transconductance is not the same as lifetime, and the relation is not a perfect one. A suprizingly reliable method is to use each tube in the diode mode, which is more directly looking at the cathode quality only. With the right kind of tube tester, and the right interpretation of what you measure, this is a very good way to estimate tube quality. Such testers like FUNKE W19 try to draw relatively high current at relatively low voltage, which is hard for used tubes. This method requires also a good database that you have to make yourself, since nobody can help you with limit values for 'bad' and 'good'. The Amplitrex works by the transconductance method, since it is practical and can use data sheet values. Transconductance is difficult to measure with lower technology testers, because it is a dynamic parameter, and for best results requires a calibrated tone generator somewhere far above the mains frequency. So you get no confusion with 50 Hz hum signal, or harmonics components of this. Precise transconductance measurement requires a lot of hardware. The good thing though, it is relatively independent of other parameters, which makes it a reliable number because you can't do much wrong. Many vintage tube testers with a red-green scale worked that way. Transconductance must be close to, or above the factory value. (in the Spec column). When it's above, is generally very good. When it is below, is also fine as long as the DC plate current of the tube is high enough. Anything above 80% of the factory value is considered a 'good' tube. What do we see in this test report? 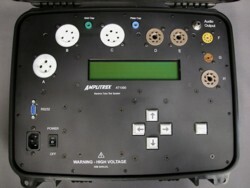 In the table 'Spec' you see the settings used for the test. These are always the standard settings, by the original manufacturers, unless there is a very important reason to take other values. 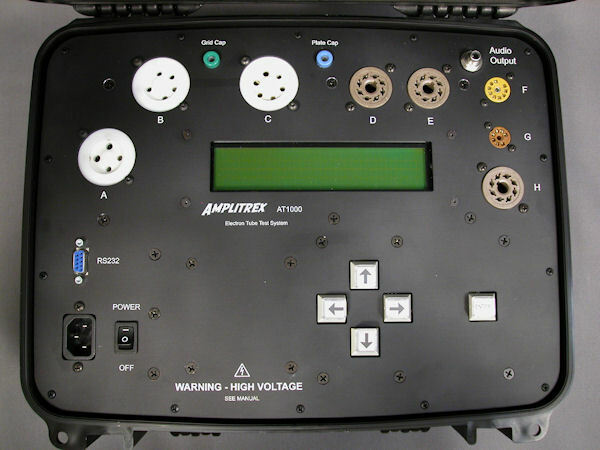 With the Amplitrex you can load the manufacturer data from the database. Now the ECC82 is a double triode, so two triodes in one bottle. So there are two tables, Result1 and Result2. We expect two main things: First, the test result should be within limits of the average value from the 'Spec' column. Second, the Columns 1 and 2 should be reasonable equal to call this a balanced tube. Auto Bias vs Fixed Bias. The AT1000 can do both. Each has is own advantages. In auto bias, the tube is set by the normal plate current, by simply finding the corresponding grid voltage for that. 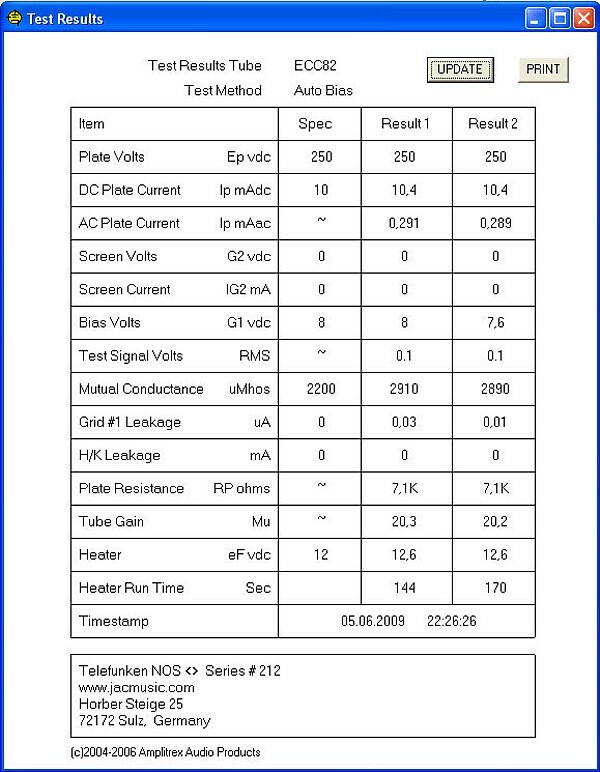 Since transconductance is depending a lot on the plate current, comparing the measured value by a data sheet value makes only sense if measured under the same conditions. This is the nice thing of auto bias. So if a tube is specified at say 10mA, and 5mA/V, the tube is forced to bias at 10mA first, and THEN transconductance is measured. So auto bias gives the most reliable transconductance measurement, that is why we use it. Fixed Bias has another purpose, and it's not quality testing. This is the older European test method, a very hard one, to measure the plate current with the fixed grid voltage. This tells in some case something about the remaining lifetime, but not always. Only when the tube is below 60...70% of normal, a lower lifetime may be expected. Smaller deviations are tolerance, and can be found with factory new tubes as well as with used ones. So be careful saying tubes that are below the average value have less lifetime. That is just guessing, and may be right or wrong. 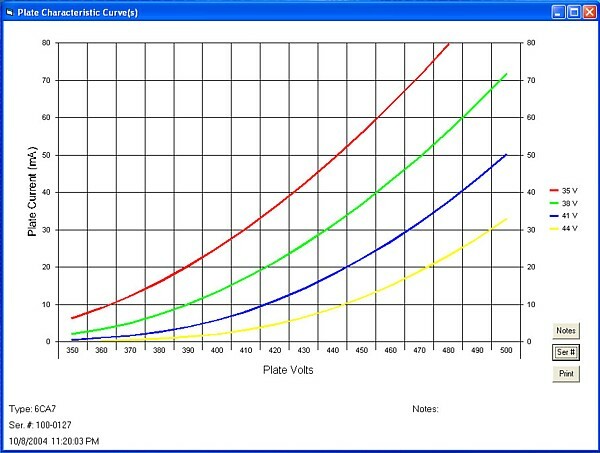 Gain is not a very important parameter for tube testing. First of all, gain in the circuit is made not just made by the tube, but also by the circuit itself. Data sheet gain by definition is unloaded gain. In a practical circuit, tubes are loaded. Tubes with different gain, will normally behave similar in the circuit. Unless defective of course. If an amplifier tube gets too old, there are a few stages of wear out. At first plate current will go down. This is nothing bad, because either auto bias, or hand adjustable bias will correct for it. Also the normal factory tolerance on plate distance causes this, meaning emission can be excellent, and yet plate current below average So plate current means not very much, if transconductance is good. Next, transconductance will go down. This will result often also in lower gain too. However for testing, it must be clearly noted that transconductance is also caused by tolerance in plate distance. Then plate impedance will begin to rise. Curiously, as gain is calculated as the product of transconductance and plate impedance, this will hold gain at a normal level and the tube works still, but distortion comes in. Next, the unloaded Gain (as measured with a tester) will rise for a final bit, and then go down sharply. Latest now, the tube will fail. As you can see from the above, gain is very difficult to put in relation to tube quality, when tested by itself only. When are tubes well matched? Heat up with heater only. Heat up the anode under continuous plate current. In this condition, the AT1000 will reject tubes with excessive plate current, or excessive grid current. It is no parameter test yet. Set the tube for average plate current by changing the grid voltage. Grid voltage needed for this may deviate, but this deviation is used for matching. The tube must stay stabile during this phase. Grid voltage is tested 3 times, and results must be identical before continuing. Otherwise the tube is not matchable. Check if plate impedance is not too high. Check if gain has not too low. Check if leakage current is not too high. Double triodes are checked for balancing. Unbalanced tubes are sold together with unmatched. The balanced tubes are now used to make pairs. How far may transconductance be away from average? Plate current and Transconductance 40..60% '?' Range. Meaning tube may still work normal in most applications. Will need replacement later. NOTE: All ranges will overlap somewhat. These do not test the tubes at the rated dissipation, do not test for leakage, and by working principle are not capable of warming up the tubes before testing. Don't understand me wrong, such testers like the utrace or E-tracer are really nice products, because they give of course the tube curves, and they have great designers behind them. Just the dynamic data and working point they test, is only sampled from a cold anode tube. It should be clear, if such data is used for matching, it does not reflect normal use conditions. Errors I have found in the range from 0% to 20%. Mostly with used tubes, using the intended plate dissipation is more important to get correct results. Also judge quality from tube curves, nobody can do that. All you can see is if the tube is good or bad, but there are better ways for that. So don't get me wrong, I really admire the utrace or E-tracer for what they can do best: Produce tube curves. But not for tube matching. How NOT to test tubes. The most common mistake of all, is to compare a tube with it's average data, and then say: The more average, the better. This is as wrong an approach as can be. Who seriously wants to do it like this, has really misunderstood a few things. Some even call average data 100%, and any deviation of that would result in a 90%, 80%, 70%. Tubes with deviation in the positive direction, so 110%, 120% are considered better than best. There is a contradiction in this, because when 100% is ideal, then 120% is not. If such (120%) tubes were better, the manufacturers would have made them like that from the beginning. Even the AT1000 (don't laugh) makes this mistake by default. But we don't have to use this part of the program, we can also test tubes another way.